Sometimes you want to switch gear and slow down a bit. It’s Friday, you have a client meeting and an after work party later on. This means you need to wear something serious yet stylish and comfortable. 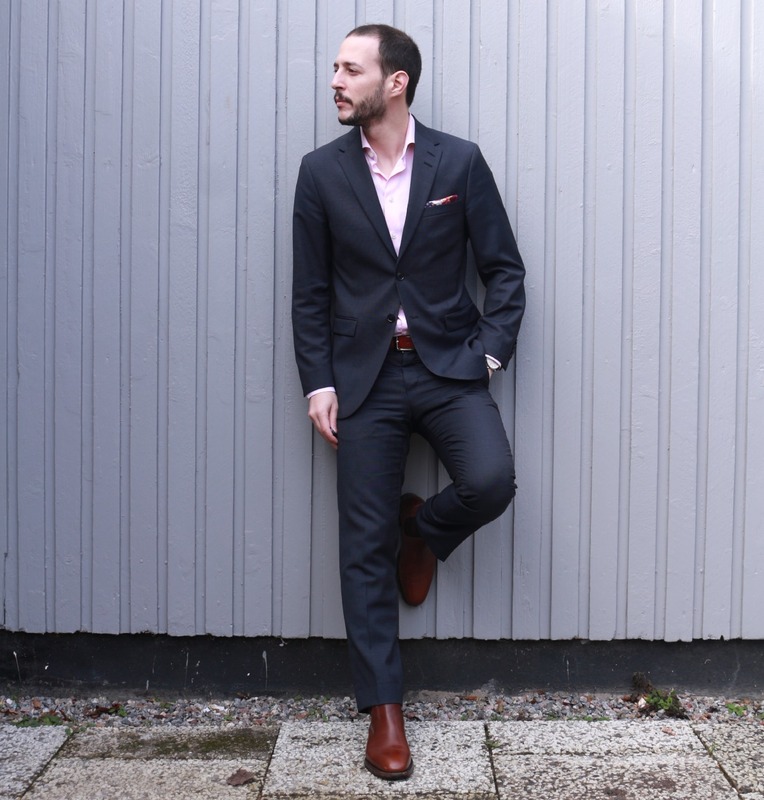 The Navy Blue Suit – Pink Shirt Combo is here to save the day effortlessly. I was in a similar situation last week and thought it would make for a nice article to talk about everyday situations. In the second OOTW I will walk you through last week’s favorite outfit. Clear and straight to the point as it should be. You can find OOTW #1 here. You always need to ask yourself “What is expected of me during the whole day?”. I promise it will make your lives easier. In this case, I had some meetings with a client on a Friday morning. The dress code in my work is flexible but I still need to look the part when I deal with clients. Afterwards, we would gather in a pub with some colleagues and friends to spend some quality time together. The setting dictates that I should wear formal clothing at work but not look out of place in a casual pub. A suit without a tie and a pair of comfortable dress shoes was the perfect choice. 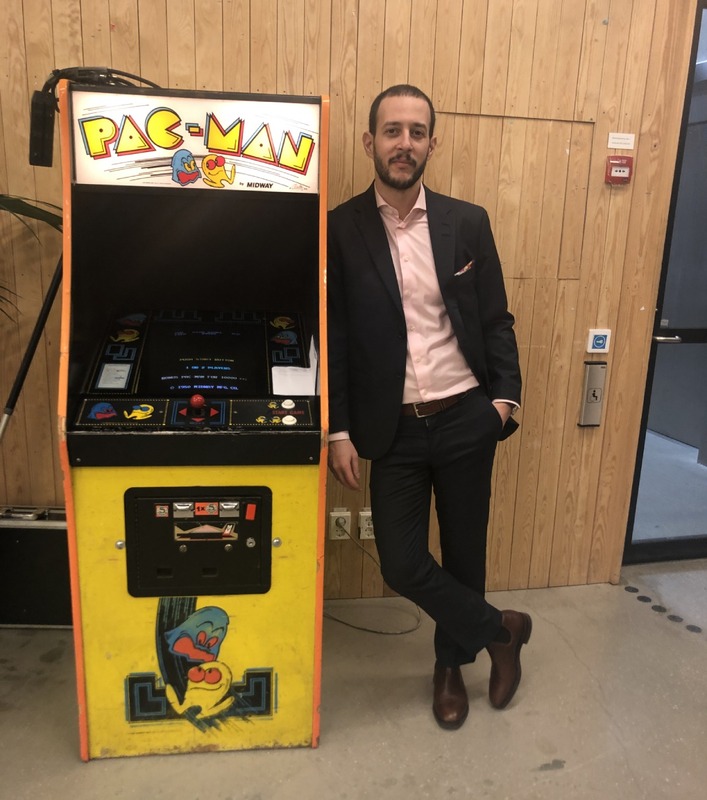 Fun fact, I stopped by the famous Royal Institute of Technology in Stockholm to visit Ms. Misiu and stumbled upon an old friend. Do you have any arcade memories? I would love to know! Last time I played this I was wearing sweatpants! Oh how times change! Here’s a list of all the items I used in this outfit. Remember that a Navy Blue Suit, Pink Shirt and Chelsea Boots will never fail you! Very simple, elegant, stylish and effortless above everything. Now let’s get to the fun part: The analysis! I knew from the get go that I wanted to wear a suit formal enough but comfortable and with a little texture. This Suit made it’s appearance in the first OOTW which shows it’s flexibility. Dark Navy, Single-Breasted and creasing resistant, it is perfect for long casual Fridays. Instead of choosing your classic “boring” dress shirts why not try light pink? It is absolutely gorgeous and shows confidence. This one is made by ETON of Sweden and is of very high quality. A Pink Shirt just feels so good with a Blue Suit, however you can wear it proudly with grey too. There is no need for a tie if you are aiming for business casual, however you can always wear one at work and then lose it for the rest of the night. Sometimes you just need to keep it simple. A man needs a pair of Chelsea Boots in 2019, period. So comfortable, so elegant and so versatile. You can wear them proudly with a suit or denim. What more is there to say about Dress Shoes that the Beatles and the Star Wars Stormtroopers wore? Navy Blue Suits in general look much better with Brown Shoes. If you have Black ones, don’t worry you can still pull it off! Nonetheless, in this occasion I feel the Blue Suit, Pink Shirt combo works best with Brown. One year of use and they still look amazing! 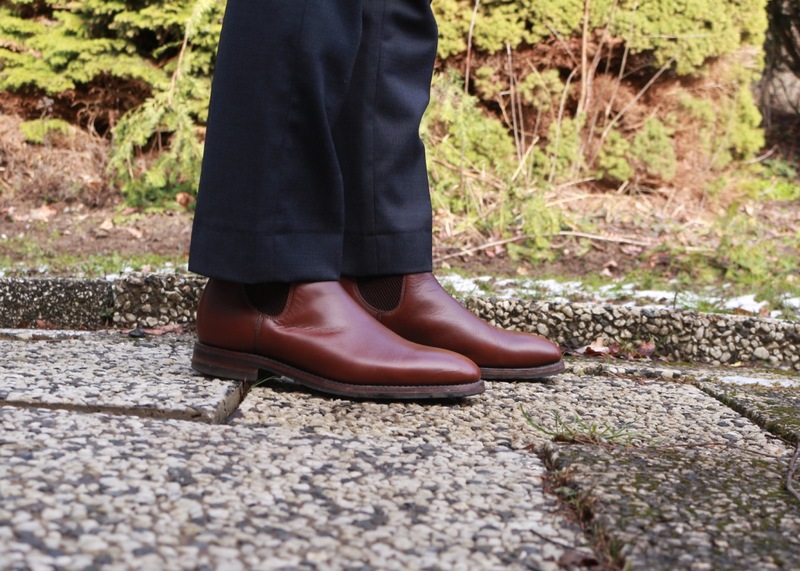 If you want to find more about the Loake 1880 Chelsea Boots, our review makes for a great read! Pablo Picasso once said that “Colors, like features, follow the changes of the emotions”. No outfit would be complete without some accessories. There is no need to overload, a nice watch and a pocket square can be your emotion changers. 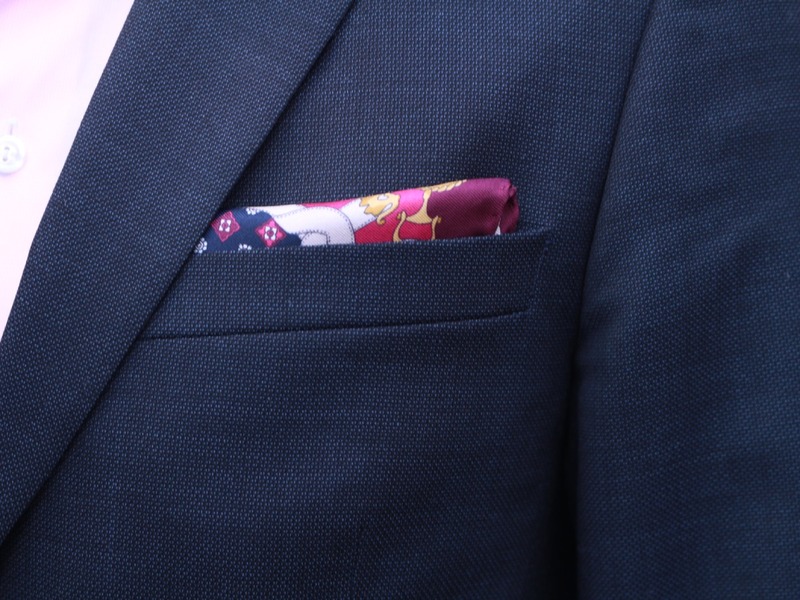 Here I sport a beautiful purple pocket square by Van Thorn, bought during my stay in magical Warsaw. Notice how well it blends with the rest of the outfit. There is blue, shades of pink and purple and a wonderful pattern exhuming adventure and happiness. 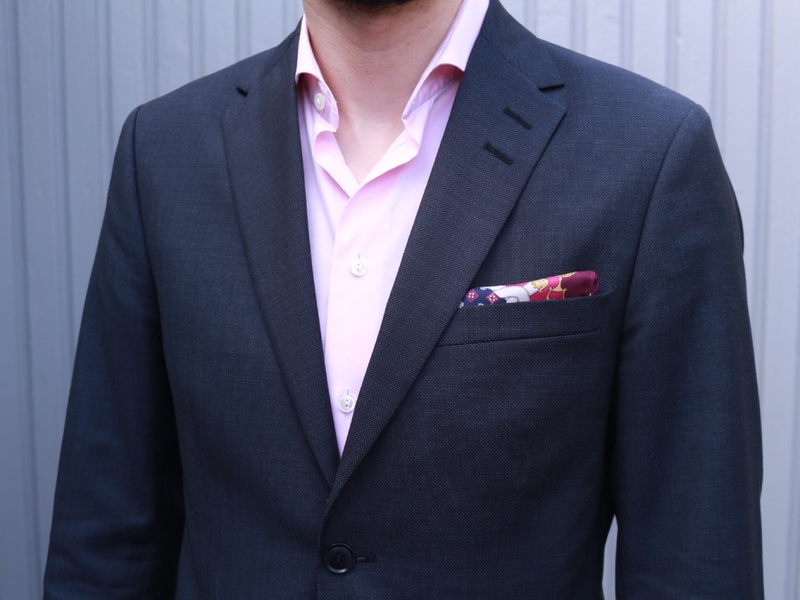 Pro Tip: Don’t match your pocket square to the exact color of your shirt. Instead pick colors in a similar shades as the rest of your outfit. I am a big fan of the “K.I.S.S.” principal which stands for “Keep It Simple Stupid!” and this was exactly the point with this outfit. You don’t need to overcomplicate things and add a bunch of unnecessary items. A simple, blue suit is a solid base and the star of the show is the shirt. Light Pink should be worn by more men! You will receive so many compliments and it is a great option for formalwear. In a sea of blue and white shirts, make a difference. Complete your outfit with a pair of smart Dress Shoes. 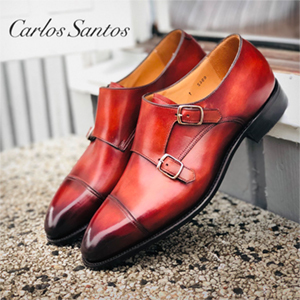 Chelsea Boots are a great option while Monk-Straps are another alternative. If you need help, check out our comprehensive guide on the First 5 Dress Shoes you should buy. This was a much smaller article than usual. What do you think of this format? Drop a comment down below and subscribe so you don’t miss a thing! I will see you in the next one Picassos.